As a Capetonian now living in Johannesburg, my soft coastal skin suffers terribly in the dry Joburg winters. Almost every product (even those that I can use happily in the Summer months) burns my skin and even with regular exfoliating, my cheeks can develop a hard thick layer of skin (gross, I know). With this background, you can quickly see that trying new products in Winter is a daunting experience. Everything stings and burns. Everything that is, until I was introduced to my new best friend, L’Occitane’s Ultra Rich Face Cream (cue round of applause). I’ve incorporated quite a few L’Occitane products into my daily routine (more reviews on the way! ), so I won’t go so far as to say my happy soft new Winter skin is ALL thanks to L’Occitane’s Ultra Rich Face Cream, but it has had a HUGE role to play in making me a much happier Capetonian in Joburg this Winter! L’Occitance are big on eco-friendly boxes and the 50ml (1.7oz) container is made of glass with a metal-look lid. 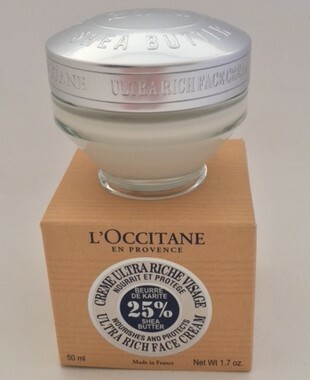 Simple, chic packaging, although I should add that the product has had a little make-over itself lately and the L’Occitane website boasts a new design for this wonder cream. A thick, white cream, enriched with 25% shea butter, L’Occitane’s Ultra Rich Face Cream absorbs quickly into your skin. You only need a little bit, so the container last quite a long time (even long enough for L’Occitane to revamp the packaging!). Retailing at around R570, I pay each cent with a smile on my face! This one is well worth it! You can buy it here. Would I buy it again? I already have! Love this product! Will have to re-review in Summer time to ensure it is not too thick for the hot months, but if you suffer from dry skin, especially in Winter, this little gem can solve (almost) all your problems! Posted in Spa Product Reviews and tagged Face, L'Occitane.